First off, let me admit to a Marvel bias in the posts I have put up on the blog so far. I guess looking at my own collecting habits, I have tended to lean toward Marvel more than any other publisher, but my collection is “equal opportunity”. I am a huge fan of Nick Cardy Aquaman, and also early Showcase books. But tonight, again, I am looking at some Marvel data. 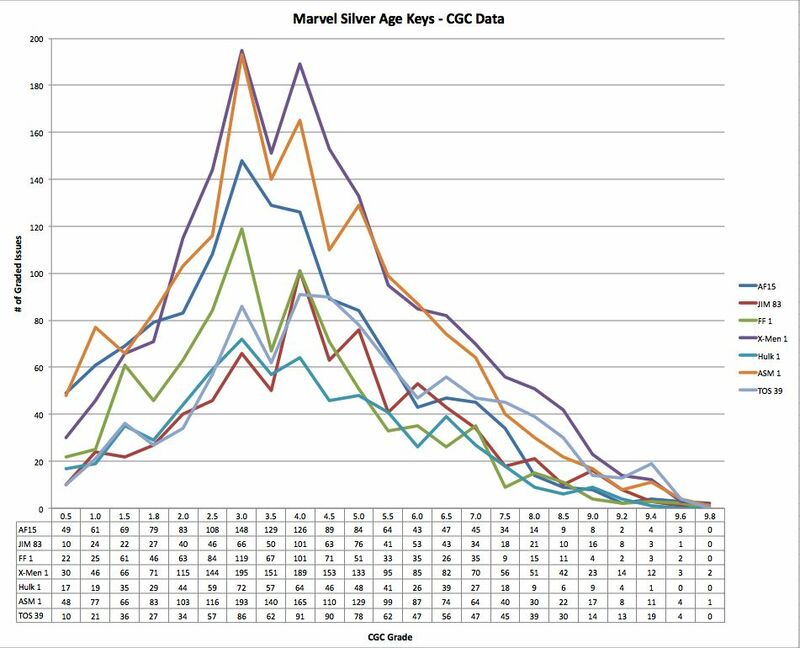 The thought occurred to me that it would be interesting to look at data comparing total number of graded copies for a given key, and then compare to other similar keys. So, that is what I have done here for key Marvel Silver Age books. A few observations pop out pretty quickly. First off (believe it or not) the thing that popped out most to me in this data, is the fact that CGC doesn’t seem to like to give out mid grades between 3 and 4, and 4 and 5. Between 3 and 4, the dip is obvious on every book. Between 4 and 5 it is less obvious, but still there. I wonder why that is? It’s not that they don’t award the grade at all obviously, but it appears that they clearly prefer to give a 3 or a 4 over a 3.5. Looking further, the fact that ASM #1 and X-Men #1 are the most graded of this lot is not a big surprise. But the magnitude of the “lead” they have over the other books is a little surprising. With 1828 total copies graded (Universal only) X-Men #1 has more than double the number of copies of FF #1 that have been graded (FF#1 is at 885 copies graded). Does this speak to rarity? Yes, I think it does. FF#1 came out in November, 1961…X-Men#1 came out in September, 1963. The Marvel revolution was in full swing at that point and I suspect that more books were published and more were likely to have been preserved. 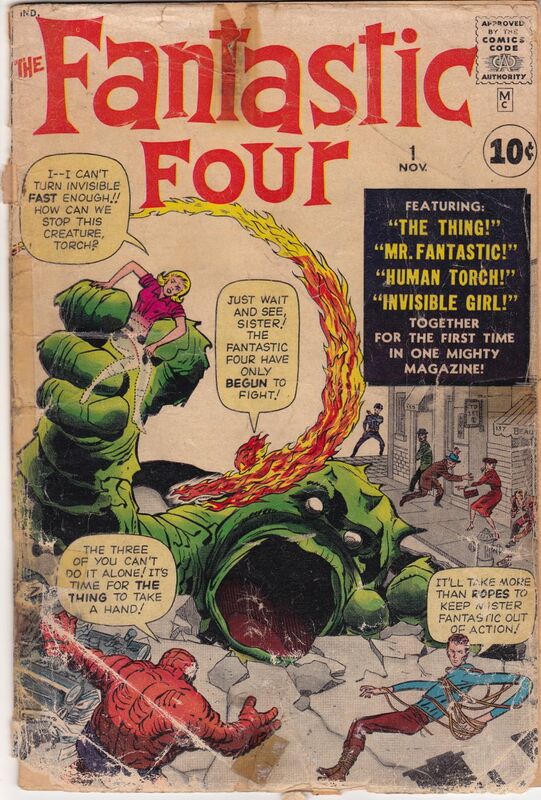 This is just off the top of my head (and I am sipping a little Tanqueray Malacca Gin at the moment), but the data seems to confirm that FF#1 is rarer than X-Men #1 (something most experienced comic collectors would have guessed anyway). And you can continue with the comparisons. Hulk #1 is the scarcest book here with only 670 graded copies. That’s only a third, approximately, of the total X-Men #1 books. Could it be character popularity, demand, scarcity? Of course…all of these will play in the number of graded books. As a buyer though…I would want to take this information, check the latest GP Analysis data, and go from there. Finally, while there is a lot you could potentially glean from this chart, the other thing that really sticks out here is that the mean, or average, grade for all the books is roughly the same. That is, the bump in the curve for all the books is in about the same place. When I started to make this chart, I was actually looking at data from Bronze age Marvel books. I will share this data in a later post (or you can look it up yourself) but the “bump in the curve” for the Bronze age books is shifted to the right significantly. Clearly, they were better preserved by adults who collected the books since the comic book collecting hobby was in full swing in the 1970’s. Anyway…that’s what I came up with looking at this data. What do you think? Don’t hesitate to comment or to contact me. This entry was posted in Amazing Spider-Man, CGC, Fantastic Four, Marvel, Thor, X-Men. Bookmark the permalink.